I also strongly recommend alerting the public to the Cylon threat – Hadrian. Straight to the Point – Some clever mechanics and sneaky tactics, but suffers from being very long and high on admin. Battlestar Galactica the Board Game puts players in the role of one of the characters from the 2004 TV series of the same name. Your goal is to reach Kobol, a habitable planet for the leftover remains of the human race. But dogging the Battlestar are the evil robots called Cylons, some of whom can disguise themselves as humans to infiltrate the ship and take it down from the inside. To start the game, people choose a character card. Each character has strengths and weaknesses, adding flavour based on their TV series persona: for example, Saul Tigh has the benefits of Cylon Hatred and Declare Martial Law, allowing him to dominate the decision making element of the game. On the other hand, he suffers with Alcoholism, meaning in times of desperation he is unable to help the other players. Players also receive a Loyalty card before the game starts. This dictates whether that person is a Cylon or a Human. This Loyalty card is kept secret from all the other players, adding intrigue to the game and tons of finger pointing, exclaiming ‘YOU’RE A CYLON!’. 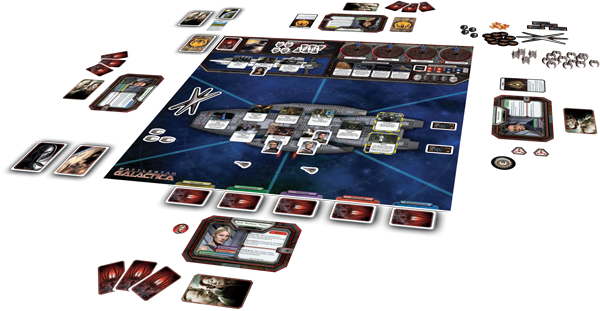 The game effectively splits the players into two teams, the Humans attempting to get to Kobol whilst the Cylons try to take it out. Each turn, players draw their Skill cards, then get to make one Move and take one Action. Moving is simple: just move your character to another section of the ship. Your action can be a variety of options, based on which room on the ship you are in, what Skill cards you have (more on this below) and what special abilities are on your character card. 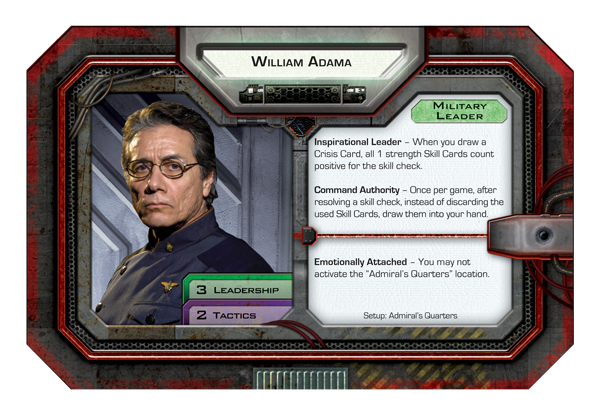 These actions can be drawing more skill cards, taking potshots at the Cylon ships attacking the ship, repairing damage done to Battlestar Galactica, or launching your own fighter ship called a Viper. This is only a taster of the Actions you can take. This gives players plenty of options during their turn, however more choice is sometimes a bad thing as each person ums and ahs. Even worse is when you have a player with a domineering personality, who then dictates other peoples turns. This isn’t a reflection on this game alone, more a weakness of the cooperative game in general, so I guess the moral of the story is leave the bossy peep in the car when you play BG! The Skill cards are colour coded cards with an Action written on them, plus a number used in the Skill checks for Crisis cards (more on this below). The cards come in five flavours: Politics (yellow), Leadership (green), Tactics (purple), Piloting (red) and Engineering (blue). Players have the choice to either play the card for its Action on their turn, or save them for the Skill checks which occur at the end of every player’s turn. 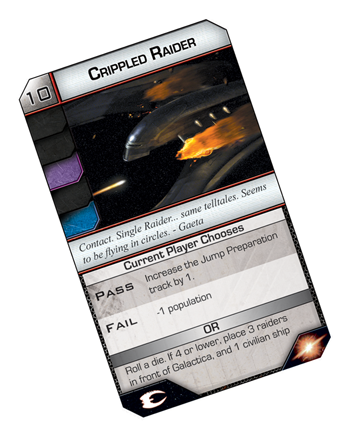 The Actions on the cards reflect which flavour they are: Piloting cards for example often help the Viper fighter ships to kill more Cylon ships, whilst Politics cards aid people in the Skill checks. So what makes this game so special? At the end of each player’s turn, they must take a card from the Crisis deck. A Crisis card – the clues in the name! Each Crisis card will have an event that, if failed, is detrimental to the players. To pass the event, the players must pass what is called a Skill check. Players take cards from their hand of Skill cards and place them face down in a pile without any of the other players seeing. Each Skill card has a colour and a number in the top corner; when completing the event on the Crisis card, you need to match the colours displayed on the Crisis card, meaning you add the numbers on the Skill cards to the Skill check. Here’s where the secret Cylon player can mess with the Skill check; cards added to the Skill check that DON’T match the colours on the Crisis card subtract from the Skill check instead of adding. If the players fail the Skill check, all manner of bad things can happen. Battlestar can lose food, fuel, population, and morale; if any of these go to zero, the Humans lose. Other bad things include Cylon ships turning up, or parts of Battlestar being wrecked, making them useless until repaired. Once the event has been resolved, the player checks the symbols at the bottom of the Crisis card. These tell the player if they need to add to the jump track, and whether any Cylon ships on the board attack Battlestar. The jump track is used to mark how close Battlestar Galactica is to using it’s FTL (Faster Than Light) control; each jump brings you closer to finding Kobol and ending the game. Whole lotta stuff in that box! Playtime is loooong, rarely being shorter than two hours (three hours is the norm for 4 or 5 player games). This is the weakness of having so many options on every player’s turn. The game tries to remedy this with a set number of turns, but this is sometimes short circuited if players are unlucky in what locations they jump to, or which Crisis cards they draw each turn. There is also a myriad of numbers, phases, ships, boarding parties, jump tracks, blah blah blah. The game does a great job of tracking all of these, but sometimes the admin each turn can be a snore. The quality of the components and rule book is high. The colours are suitably muted yet bold, using images from the TV series on the cards and board to give players a more immersive connection to the franchise as a whole. The text on some of the cards is a bit on the small size, but still legible. The ships are all decently casted plastics (except the Cylon Basestars), with the Vipers and Raiders looking particularly cool! The card tokens are robust, meaning damage is minimal from muliple playthroughs. And here is where the game stumbles. With a long play time and a sometimes difficult rule book to follow, this game for me is a once in a while play. Don’t get me wrong; it’s still a decent game, with clever mechanics and good variety from the multiple decks and cards. It’s just that sometimes, with the high number of player Action choices, the level of admin per turn and the cooperative game weakness of constant discussion, you sometimes just feel the game is playing you instead of the other way around. Battlestar Galactica the Board Game is also notorious for being quite difficult, meaning that after three hours of slogging though Cylon fleets, food shortages and short jumps, you end up losing anyway. Images courtesy of Fantsay Flight Games.